The Blue Mist Shrubs (Caryopteris x clandonensis) are in full bloom right now providing a cool blue for the landscape and some late-season pollen for the bees! Also known as Bluebeard, it is a small, long blooming shrub growing 2-3 ‘ high with a mounding habit making it useful in many different landscape situations including foundations, island beds, mixed borders, perennial gardens or even massed along a stone wall! Many people are drawn to the blue and purple pallet because they’re cool and calming colors. They combine well with yellows and golds, something you see a lot of this time of year, but also chartreuse and pink (ie Blushing Knockout Rose!). The leaves are a soft gray-green which contrast nicely when it’s in flower. Note also that the leaves are pleasantly aromatic. 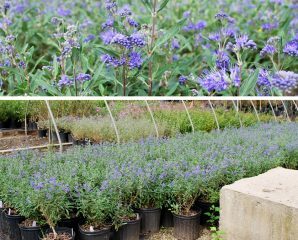 Success with Blue Mist Shrub is dependent on good soil preparation – the key words being loose, and well-drained! They bloom on new wood so yearly maintenance should include pruning back late winter, much like Butterfly Bush. Also you may see some winter dieback in cold winters, so this pruning is helpful for a good fall show. Tip: Underplant with Spring Bulbs! Try the early flowering Crocus or the mid-season Grape Hyacinths (Muscari).